“[The word] family has a special significance for Steinway & Sons,” announces Guido Zimmermann, managing director for Steinway Europe, during a special anniversary dinner to celebrate 25 years of the Boston Piano designed by Steinway & Sons. 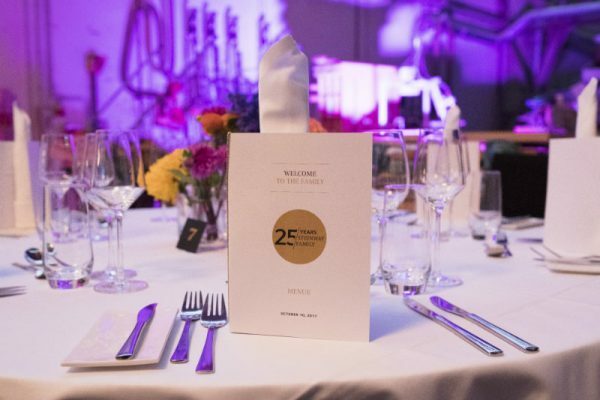 With production briefly halted and machinery pushed to one side, a small part of the Hamburg factory was transformed into an exclusive dining area, creating a unique venue and occasion. The mood lighting, starched-white linen on the tables, and glistening glassware complemented the family of Steinway Piano brands—consisting of the Steinway, Boston, Essex, and Spirio—lined-up like art sculptures in a contemporary gallery, waiting to be played. It has been 25 years since the Boston Piano first launched and ushered in a new era for the world’s finest piano maker. In the late 1980s, chief piano designer Susan Kenagy and colleagues were tasked with designing a new brand of Steinway. Since 1992, 89,000 Boston pianos have been produced and have been well received by the piano-playing world. The “clarity of tone, breadth of dynamic and responsive action” mark out the Boston line of pianos as best-in-class within their market segment. The reason being is that the Boston carries the Steinway DNA and genome throughout. A good example of this is that the Steinway Piano has a wide-tail design and so does the Boston. Based on the success of the Boston, the company developed the Essex line, which was Steinway’s third brand of pianos, offering a similar concept to the Boston. It incorporates some Steinway features but not others, and while it is designed by the company, it is built in China and not Japan where the Boston is. It also comes in at a lower price point, but again it is said to be the best piano in its class and respective quality segment. Having been given an exclusive behind-the-scenes tour around the factory, it gave us a first-hand insight into the painstaking dedication given to each part of the manufacturing process to produce just one piano. In the late 1800s, more than 100 patents formed the basis for today’s modern concert grand piano; copies of original patents hang in various departments of the factory, a reminder of the original lineage and history that still goes into making a Steinway. It takes two years alone to naturally dry the precious woods that go into making a Steinway grand piano. In the third and final year of production the complex musical instrument is assembled. We watched intently, as around 20 layers of maple wood were glued together, before the case (rim) of the Steinway grand was bent into shape, emerging as the famous wide-tail piano contour, and then clamped in position to set. 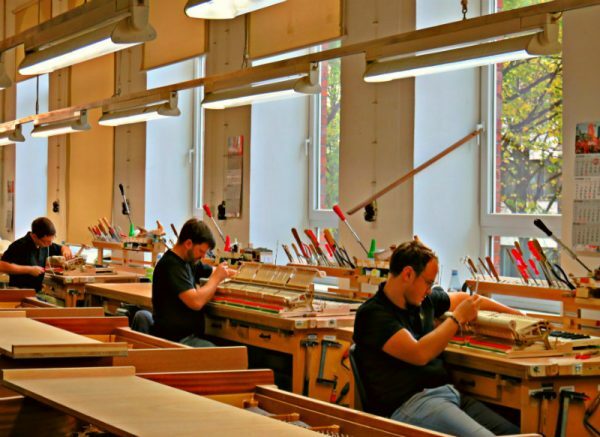 As we walk between the various areas of the Hamburg plant, small teams of workers diligently create their own melodies of manufacture: from the sanding and painting to the veneering and tuning. Eighty percent of this process is still hand-crafted, and with 12,100 pieces contained within a grand piano it is no wonder that most concert halls in the world have and trust a Steinway piano. 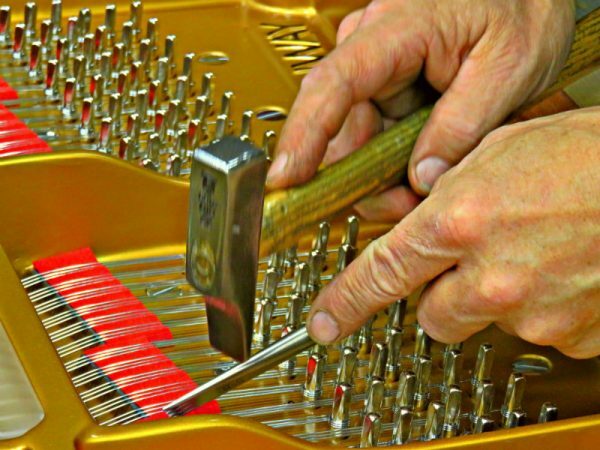 Whichever brand of Steinway-designed piano is being put together, whether in the U.S., Germany, China or Japan, each product is rigorously tested and will contain the Steinway methodology. So much so, that every Boston and Essex produced in the Far East is shipped to the Hamburg Distribution Centre located moments from the factory, where trained technicians ensure its quality before it heads to a dealership. The family of Steinway workers are loved as much as the complex instruments are by the world’s best pianists. As we walk towards the factory canteen, we see the stairwell is adorned with long-service certificates for employees, starting from 25 years onwards; 80 members of staff have worked for the company for 40 years and another 12 have been there for 50 years. Steinway and his sons founded the company in 1853. Guido Zimmerman has been with the company only 5 months but understands the value of the family ethic. “We all stick together, we count on each other and this has been so for many generations,” he says. The same can be said of another important part of the family, that of the Steinway family of artists, who number around 1,800 global pianists. This unique collaboration between the best pianists on the planet and Steinway has created a mutual bond and relationship between brand and artist, who have committed to play a Steinway piano wherever possible. 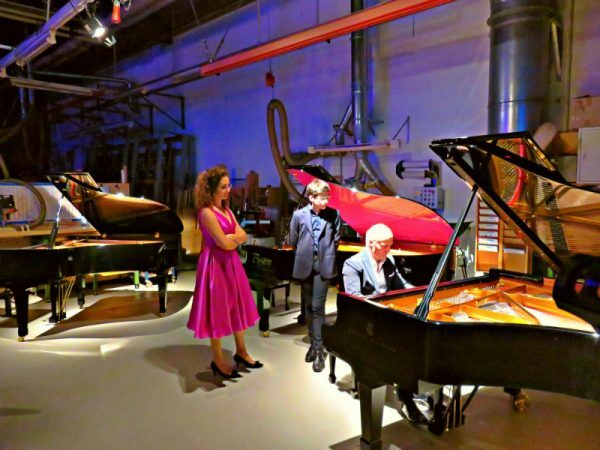 During the anniversary dinner, one of the family of artists, Joja Wendt, played the Steinway Model D, producing the warm, rich, singing tone of a superior engineered musical instrument. As important as it is for the company to work with experienced artists, there is a need for them to nurture, develop, and help produce a new generation of young artists. Wendt introduced competition-winning talents: Alba Shkreli, 17, who performed on the Boston Rainbow GP-193, and Florian Albrecht, 15, who performed on the Essex EGP-173, both of whom played with such artistry and confidence it belied their ages. 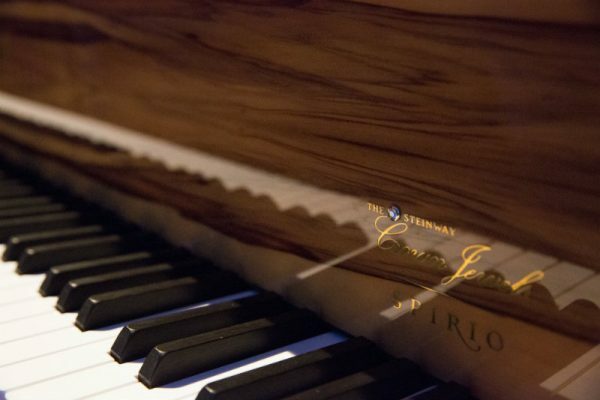 Steinway & Sons is as committed to looking forwards as it is looking back. The Spirio brand is the latest innovation of the company. “Keeping alive the innovating spirit of the founder Heinrich E Steinweg, we continue in the tradition to improve the quality of the product,” Zimmerman states. 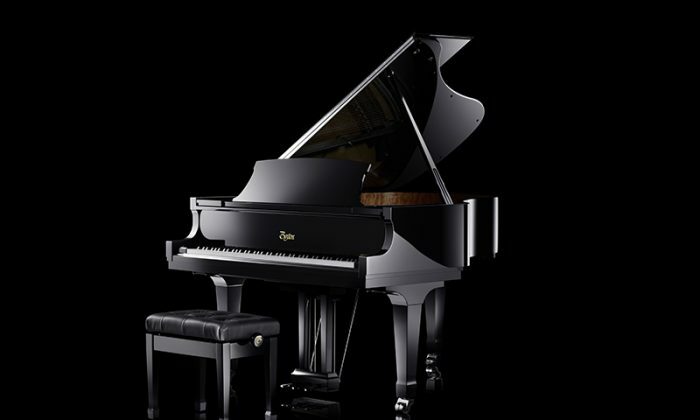 As the newest arrival to the family of brands, the Spirio mixes heritage with innovation by bringing the player piano to those who wish to own and play a Steinway, but also to those who wish to listen to the world’s best pianists in their living room. The Spirio technology allows that to happen. For Steinway & Sons, family is the integral ingredient that has fostered, created, and sustained its continuing reputation as the finest piano maker in the world. Since its inception, Steinway has built 603,000 pianos, so just imagine the family celebrations when they reach a million, which with increased production goals may not be too far away. 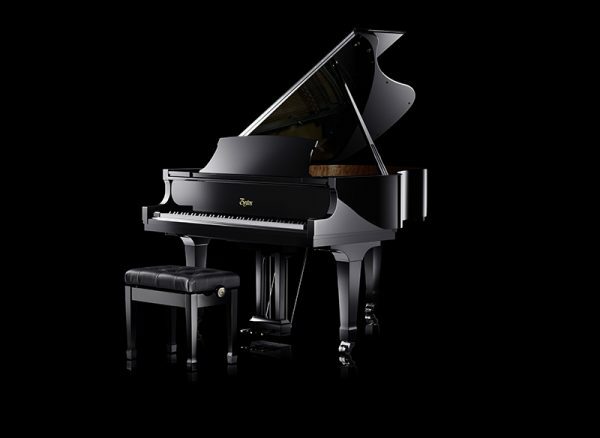 For further information please go to www.steinway.com. Ramy Salameh is an award-winning travel journalist with membership of the NUJ and London Press Club.